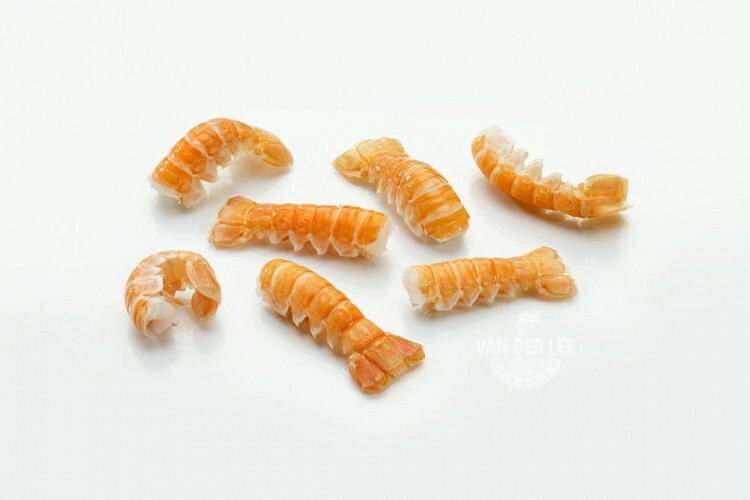 We have prawn tails available from the Norway prawn lobster. This type of lobster is also known as the Dublin Bay prawn, langoustine, scampi, or by its Latin name, which is Nephrops norvegicus. You can find the Norway lobster in the north-eastern Atlantic Ocean, parts of the Mediterranean Sea and in the North Sea, which is also known as FAO 27. Because the Norway lobster can also be found in the North Sea, we are able to catch our Norway lobster ourselves. When the lobsters are caught, we immediately freeze them to keep them fresh. As a supplier we only sell the tails of the lobster, since they contain the most meat. The Norway lobster can be recognized by its pink to orange colour with dark spots on the claws and abdomen. The meat of the lobster is lean and has a refined taste. One hundred grams of the tails will contain around 97 calories. However, this depends on the way in which you prepare them of course. Moreover, the prawn tails contain a lot of proteins and vitamins. We export our prawn tails mainly to catering industries and retailers in Italy, Spain and France. However, the prawn tails are also eaten in other countries of course. There are different ways to prepare our delicious prawn tails. For example, you can put them in a paella or in a soup. However, you can also eat them cooked. Another way to prepare the prawn tails is to prepare them in herb butter, garlic butter or a vinaigrette. This will add even more flavour to the dish.